← Day 90: My Life w Car…the 90 Day Round-up! Starbucks has created an online VR game for learning about carbon footprint, alternative transportation, etc. It’s called Planet Green Game and like all VR games, you choose a personality and then head out on your “adventure.” You choose your transporation options, you go to different places and then you get points (or demerits) for your actions and choices. Kinda dull, but I do recommend going to the Movies as soon as possible–they’ve got some indie shorts that are pretty good and worth watching. The site also offers Starbucks itself as part of your virtual city adventure–and I sort of thought: not only are they on every corner, now they’re on every virtual corner, too. But hey. Starbucks does a lot of good, green stuff so I give them some points for this–credit where credit is due. They, in turn, gave me about 3500 points before I signed off and called me a Journeyman–not sure what that meant or if I could have been more if I’d stayed on longer? Maybe kids would like it–it’s sorta fun, so check it out. Tom over at Mytechvision has an interesting article about new solar power plant project that use mirrors and water towers. The mirrors reflect the sunlight back into the tower heating the water to like 400C or so which creates enough energy to heat 6000 homes. 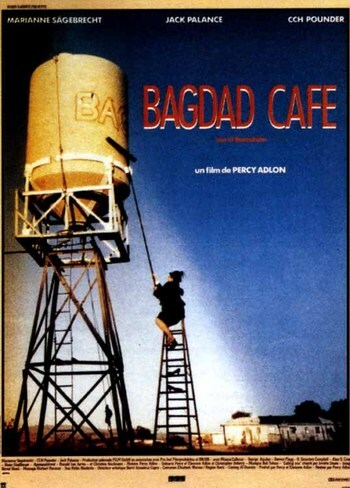 This makes me think of something off the wall: a 1987 movie named Bagdad Cafe–great flick, see it if you haven’t. Anyway, one of the characters paints these desert scenes wherein a blinding light radiates from the horizon; the main character, Jasmine, thinks this is a mystical light but in the end it’s revealed that this light is actually from a solar power plant. So my question is: has this technology been around for a while? Finally, a review of hard-nosed reasons big businesses might be compelled to go green–nothing new here, and that’s what’s news. The same practices that are in place in the best companies will find an affinity with green initiatives: eliminating waste, how to leverage price differentials, market share through leadership, new studies showing environmentally sound companies are more efficient and well run overall–and tend to attract a better hiring pool. Interesting opinion piece here. This entry was posted in alternative energy, Bus, corporate green initiatives, environment, green, green investing. Bookmark the permalink.